The B2B services that all small businesses need are managed by affluent founders who do not always see themselves as affluent. Because they are not aware that their lives are so different than the majority of people who own small businesses, they are not adequately reaching 80% of small business owners who need their services. Some of this is by design because it is much easier to maximize income when you market only to those with deep pockets, but much of it is because they are failing to recognize that small business owners are NOT like them and do not see any of their promotions. “To identify small firms eligible for its programs, the SBA uses industry-specific size standards that are based on sales or number of employees. If based on sales, the threshold ranges from just under $1 million to $35.5 million, but most industries employ the $7 million benchmark level. If based on number of employees (capital intensive industries), employment levels range from 50 to 1,500 employees, but most industries employ the 500 employee benchmark level. For research purposes,the SBA generally uses firms with fewer than 500 employees.” See SBA.gov. Just as agencies only care about corporate accounts with the deepest pockets, the SBA only counts and serves small businesses with significant financial resources. The majority of all small businesses and workers in the United States are considered unimportant by those whose only priority is maximizing profits regardless of the consequences. 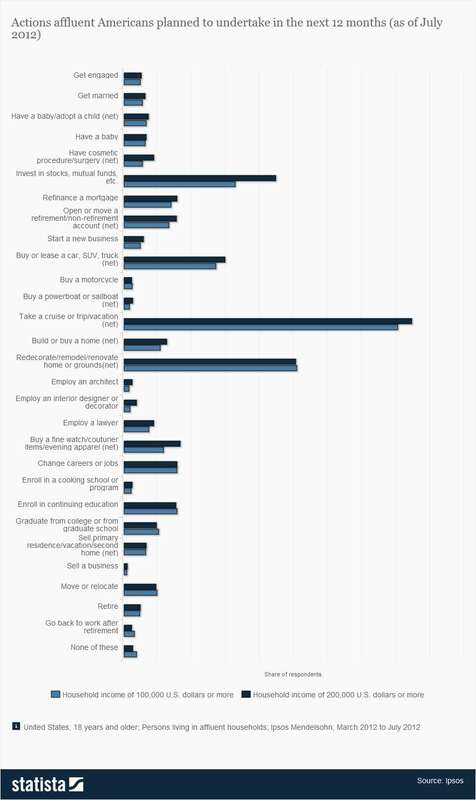 How important are http://blog.viewbix.com/blogsmall businesses to the U.S. economy? • Generated 65 percent of net new jobs over the pasthttp://blog.viewbix.com/blog 17 years. Source: U.S. Dept. of Commerce, Census Bureau and Intl. Trade Admin. ; Advocacy-fundehttp://blog.viewbix.com/blogd research by Kathryn Kobe, 2007 and CHI Research, 2003 U.S. Dept. of Labor, Bureau of Labor Statistics. According to the SBA, how many small businesses are there? In 2009,there were 27.5 million businesses in the United States, according to Office of Advocacy estimates.The latest available Census data show that there were 6.0 million firms with employees in 2007 and 21.4 million without employees in 2008. 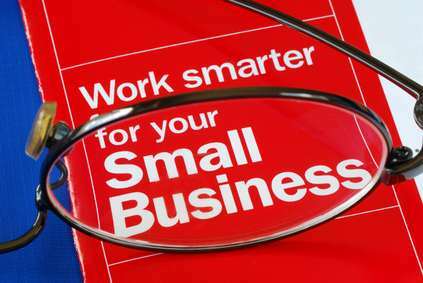 Small firms with fewer than 500 employees represent 99.9 percent of the total ( employers and non-employers), as the most recent data show there were about 18,311 large businesses in 2007. Source: Office of Advocacy estimates based on data from the U.S. Dept. of Commerce, Census Bureau, and trends from the U.S. Dept. of Labor, Bureau of Labour Statistics, Business Employment Dynamics. See SBA FAQs. The short answer is that it takes just as long to selhttp://blog.viewbix.com/blogl a $50,000 service to a large company as it does to sell a $200 service to a small one. In order to maximize potential income, most B2Bs not only market specifically to businesses with deep pockets – they actually turn away any small jobs that come their way. Important services every small business should be using such as Universal Business Listings (UBL), Knowem, Alerti, ViewBix and other small business solutions are regularly written about on sites such as Forbes, and industry blogs such as Mashable, TechCrunch, SmallBizTrends and Social Media Examiner. They are well known to agencies because of that coverage and because agencies attend major events such as Pubcon, Search Engine Strategies, Affiliate Summit, and Social Media Success Summit. The owners and managers of 80% of small businesses will never use an agency. They do not read Forbes or the NY Times. They do not spend their time reading SEO, Internet Marketing, or Social Media Marketing blogs. They do not attend any events outside their own industries – and most small businesses do not even attend events IN their own industry. These events and publications only reach the largest of small businesses. For agencies, that doesn’t matter because these small businesses typically do not hire agencies. read those sites, or attend those events. For Alerti, Knowem, UBL, Viewbix and other small business solutions, there is a huge untapped market of businesses that can afford their services and definitely need them. 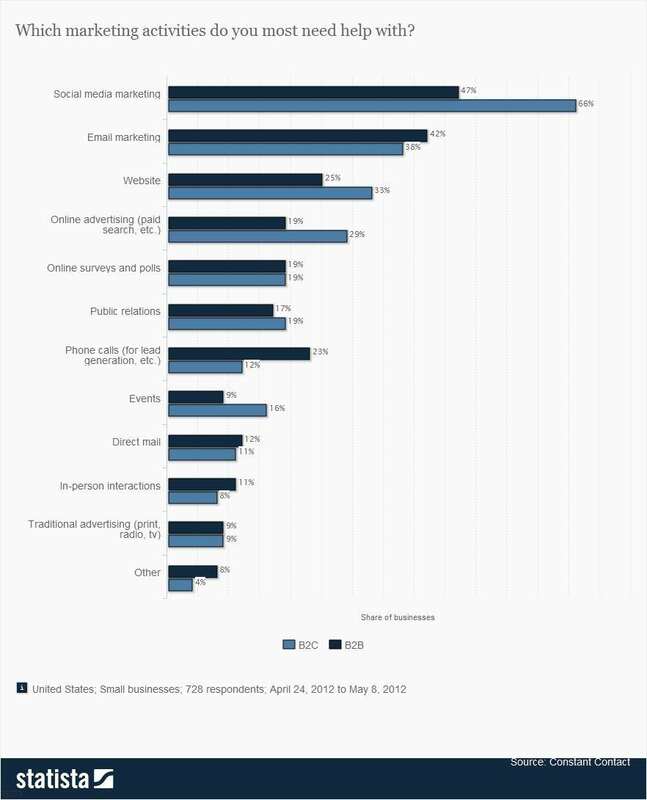 And there is a way to reach these small businesses, but it is not content marketing, events, case studies, or social media. What Small Businesses Are Unserved? Individuals who work for themselves providing services such as handymen, gardeners, pool cleaners, cleaning services, many plumbers, electricians and other service providers. Obviously, there is some overlap as individuals get more work than they can handle and hire others to assist them – but because they worked their way up they will not suddenly start reading Forbes and knowing about Internet Marketing. 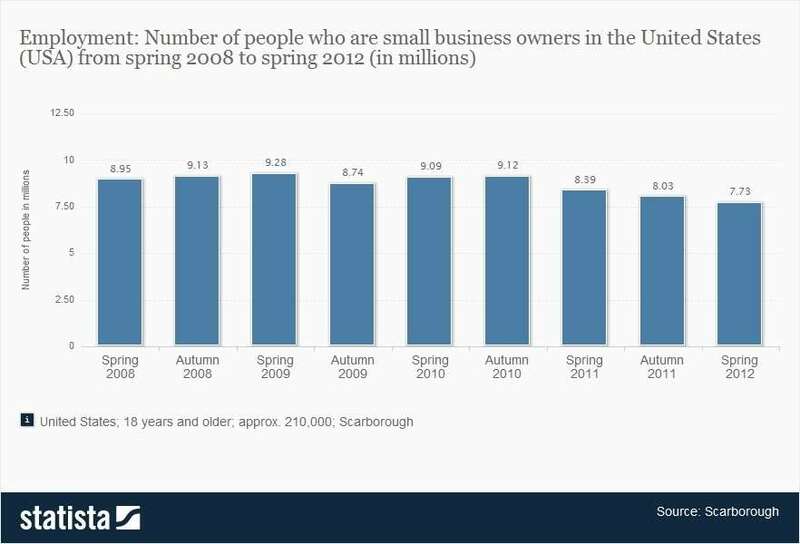 Number of small business owners in United States (USA) from spring 2008 to spring 2012.
small business solutions are growing in importance. are underemployed and unemployed their existing customers have less money to spend. There are 9.4 million smbiz tax filers reporting $335 billion net business income. Slightly more than one-fifth of small businesses qualify as an employer. Employers were considerably larger than non-employers, reporting average total income of $922,100, compared to $99,900 for non-employers, and average net income of $45,300, compared to $15,500 for non-employers. Note that the larger of these small businesses only have an average net income of $45,300. Unlike the accounting used by corporations and the more affluent, in most cases that will be what they are actually living on – not how much profit they had after they paid themselves a salary! your services. How many of these are you currently serving? These businesses CAN afford you – but not an agency. who sells and uses your services on their behalf. Social Media savvy bloggers have the experience they need and more and more of them are making a living offering their services to small businesses. We need to expedite that process and make connecting them faster and easier. Almost all case studies and market research is done on behalf of Fortune 500 companies. Successful PR, Marketing, and SEO agencies primarily serve larger corporations. They then use these studies to advise small businesses even though they should know that what works for Coca-Cola or Nike is NOT necessarily a good strategy for even the largest small businesses. The best market research and case studies are beyond the ability of most small business owners or managers to understand. MarketingPilgrim, MECLabs, Marketing Experiments, and Hubspot all produce exceptional research – but this untapped market I’m talking about does not read it and never will. Small business owners are busy running their businesses. Many of them are new to using the Internet and may barely use email or a cell phone. They do not have the time or resources to learn to do what they need done. Bloggers have spent the last 4-5 years honing what have turned out to be complex skills ranging from SEO to optimizing Local Search Directory Listings to content creation. Even after investing hundreds to thousands of hours they still have much to learn. Just as larger businesses are NOT the primary users of services like UBL, Knowem, and Alerti – the agencies they hire are – smaller businesses are not going to be who actually uses your services. They do not know how and most of them are not likely to be willing to learn. Agencies exist and deliver most of your business to you because business managers and owners are willing to pay to have someone else handle these challenges. Your untapped market will be reached by serious bloggers turned consultants who will actually be using your services on behalf of an ever growing percentage of those 9.4 million small businesses. While most bloggers originally are self taught, they eventually start sharing what they know with each other. Loose collaborations turn into more formal mentoring programs. Experts with particular skills become well known and they become the support system. Leaders teach the best and brightest and they identify leaders who then become the next level of mentors. programs that teach the importance of using their services. The way that UBL, Knowem, Alerti, and any other B2B service will gain market share is by supporting the early leaders who provide free support to those they train to use your services. There is no guarantee that any site will last forever and your time and efforts there may be lost – so choose where you spend your time wisely. What I predict will happen is that leading influential social media savvy bloggers will join together to create geo-targeted group blogs where local communities will form. Leaders will not have any out-of-pocket expenses. All overhead will be covered and income the site generates will cover cost on those expenses. Joint venture / revenue sharing model allowing bloggers to make money leading to being able to make a living. Identify educators and provide them with a curriculum so that students can provide content. Their assignments will give them real world experience doing what benefits their own communities and be able to generate income. Students showing promise will receive free mentoring and internships (unpaid at first, but quickly working into paid work) and actually create their own jobs. Local businesses will benefit as students write about their favorite restaurants, cars, movies, gathering places, events, etc. about those they like best, giving them valuable free visibility. not only those who can afford to buy advertising. We need to stop telling small businesses they need their own blogs. Few of them have the time or resources to manage a blog. What they need is to own their own domain name they can point at whatever page or post best explains what they have to offer their target audience. With many bloggers working together to create the best sites for any given geographic location, those sites will become well known. As their incomes increase, they can add traditional offline advertising to free methods employed both online and off. They will not be reliant on the ever fickle algorithms of Google. We will roll these out first in college towns where they will naturally go viral. Together we can create a small business revival that turns the economy around – at least for those who recognize the connection between where you spend your money and economic survival. leave a comment in this post or contact me. The DIRJournal directory and blogs are an integral and beneficial part of supporting small businesses. Those listed in the directory will benefit from the local community sites and from being featured in the eight DIRJournal blogs. I encourage you to list your business and reach out to me so I know you are small business friendly. Right now through Tuesday, Jan 8, 2013 until noon ONLY you can get 25% off using discount code Holiday2012. Leave a comment here for a chance to win a $249.95 permanent, featured listing. If you are interested in what I and the other contributors to DIRJournal’s blogs write, I encourage you to subscribe to the DIRJournal blogs. Awesome article…This is my exact market..I am fully aware of the need for coaching and consulting in this market….i learned this from being part owner of a salon with my wife, and she is now using google apps to run her business better. Personal interaction still works….getting 50-100 small business owners and solopreneurs in a room that paid you $50-$100 to show them how to use google apps to help them with their business…still pays the bills. It’s Even better when they want the apps customized. I have always believed in this market and i think 2013 will prove very profitable for those who serve them, because bigger companies don’t know how. Thanks for commenting, Jon. As you’ve learned, small businesses have so many hats to wear that they need experienced consultants to teach new skills. Google Apps would not be what I would focus on though because I consider it unwise to make your business data public. Even if you limit who can access Google Docs, Google is the entity that poses the greatest threat to small business and privacy. Hi Gail, I’m truly impressed with this post. I can’t imagine the research time involved. I’ve done a little local consulting in the past but pulled away from it lately. It’s tough to get a handle on control and time. By control, I mean not letting the client dictate every move they “think” is needed. I spent many hours trying to educate small business only to end up creating nightmares. As an example, I had several clients that needed a simple website built. Once the site was built, my intention was to create a retained relationship for updates and such and content if needed. What ended up happening, however, was constant calls and meetings for silly word or color changes. I mean things like change “do not” to “don’t” or several changes from their first edits. It was like that joke where the lady has the movers rearranging the living room furniture a dozen times but nothing is to her liking. I had one business owner call me so often I refunded the retainer and said good luck. That was an extreme case but a real eyeopener for me. Another business was stealing content from competitor sites and gave my number to the one that threatened to file a lawsuit. I only bring these things up because they are some of the things that your service can help others to avoid. Solutions I found involve things like a clear cut contract/agreement and spending more time explaining “additional services and fees”. It’s really an exciting service you are setting up and an important one. I know from personal experience that it’s a tough way to learn when you are shooting from the hip. Thank you for taking the time to comment. Small businesses are under-served and it isn’t only because of financial reasons. Being overly demanding is something those who work with corporations put up with because there is so much money on the table. That incentive is not there for small business. As you found out, they often do not understand what is important and dwell on what isn’t. As you well know – being so many years experience in – anyone who thinks blogging or ecommerce or email marketing or ppc or just about anything else is “easy” does not understand what they’re doing yet. They may never figure out that success comes from exceptional implementation, specialization and testing – not just throwing any old site up or email out the door and believing they’re doing all they can. When I started mentoring experienced bloggers and discovered they lacked basic skills and had difficulty grasping important concepts I realized we have to train the bloggers to support the small businesses. Training the small businesses is not feasible. I make it a point to know identify and connect with all the expertise needed. For example, I could have recommended a couple of people for your secure ecommerce needs and I go out of my way to highlight the very best in posts like yesterday’s Small Business Priorities for 2013. This year I believe leading bloggers like Kiesha, Bryan, you, me and many others who have been rowing in parallel directions will make time to connect and pool knowledge and resources. One of our major callings is to build relationships online and off so that people know who they can trust and what they should pay to implement because we only recommend what really works and the very top experts at what they do. It can take years to get a small business to trust and listen to your advice. Sometimes even then they are resistant to doing what they must do. Much of that is because they don’t understand complicated tasks like conversion optimization enough to trust someone else to do it for them. They need to learn who to trust and follow their advice, because it is not reasonable to be able to do everything yourself. There is not enough time to learn it all – much less gain experience and keep current on your skills. Love how you debunked the myth that a small business needs $1 million to exist. That is a junk measure established by those who have no clue how to run a small business. Thanks for taking the time to comment. They probably read the information the SBA puts out about raising six figures before you can start a business. The majority of small businesses operate like most working class people do – month to month. Thanks for sharing my predictions here, Eren. There are many who can benefit from seeing this information: small businesses, bloggers and B2B solutions providers. It’s fantastic that youu are getting ideas from this paragraph as well as from our argument made here.